1) End Zero Tolerance, and implement Restorative Justice. 2) Hire More Black Teachers in our Schools. One event is at Seattle Public Libraries. The very latest update is that the Board will be having a Work Session this week on the superintendent search. It's Tuesday from 4:40-6:30 pm in the Board conference room. I would assume all the Board would be in attendance but who might represent staff will be interesting to see. As for the community meeting held at Nova High School on January 18th, here's what I saw and heard. It was an underwhelming-sized crowd, maybe 35 people. And I wish there were more community meetings to get input. President Leslie Harris led the meeting with Director Eden Mack in attendance. President Harris said that "we want a superintendent for longer than 3-4 years and want someone who is excited to be here and leverage gains made for the next 10 years." She said that Seattle is a wealthy city but that the rich/poor and race/ethnicity gaps remain and closing that is the single most important thing to get done. It was noted that the application for superintendent had already gone out as of that date and that the district was looking for leadership; not just from educators but from others who have shown they can be agents of change. Update: a great compilation of dual courses (AP/IB/CIHS, not Running Start) created by parent Bonnie Manley Heidal. I note from Facebook questions that it's not entirely accurate but, as I pointed out, this is what the district/schools are publishing in their master schedules. Fine, if it's wrong, then correct it but inaccurate schedules only serve to confuse parents and students. Thanks to Bonnie. I put this up for anyone who wants to weigh in on the parent meeting last night a Ballard High on this topic. Great article about the need for civics from an article at Crosscut about the visit of Justice Sonia Sotomayor. What's Going on in State Public Education Funding? What is going on with state education funding? Hey, guess who's coming to breakfast with the Washington Policy Center? Former D. C. Chancellor of schools Michelle Rhee on Valentine's Day. We hope you can join us on February 14th to hear her dynamic presentation on her experience with education reform in Washington, D.c. and ideas for education reform today. A Thurston County judge ruled that yes, our state legislators do have to respond to public disclosure requests. This story from KNKX doesn't have it included but yes, they will go to the Washington State Supreme Court. Please join Seattle Public Schools Vision Services Program for a discussion panel of adults with visual impairment and parents that have raised individuals with visual impairments. Hear their experiences growing up VI, navigating the school system, ask questions and have an opportunity to engage in personal discussions. Jack Straw will be doing activities with students in the cafeteria, while parents attend the discussion panel in our library. Light refreshments will be served & free parking provided in the school lot. Families of students with visual impairment from across the Puget Sound area are all welcome! We hope you can join us! Thursday January 25, 6:00 p.m. — 8:00 p.m. This topic appears to have snuck under the radar of the board (other than Director Burke, as the chair of curriculum). The curriculum "alignment"team has been able to move forward with these changes without gaining the attention of the broader board members by re-terming the changes "alignment", so as to not trigger a broader board review. These proposed changes for the incoming freshman class of '18-19 would dictate a mandatory science curriculum pathway for all high school students. In creating this pathway, the curriculum team will dissolve the majority of SPS student's access to AP chemistry, AP biology, and the wildly popular and successful biotech academy at Ballard High School. I am working with other parents on organizing a community meeting at Ballard High School on Thursday, January 25th at 7 pm. (Final time TBD based on room availability). As things currently stand, there has been minimal piloting of proposed district-wide curriculum changes, no educator training, and minimal reassurance that the changes would meet college pre-requisite standards. Although the district website reports that revised courses were created as of fall 2017, no details have been provided to the high school teachers tasked with teaching these classes. Buried in the SPS website are 4 " family science engagement nights". Our goal is to have a parent action plan in place prior to these meetings. The science department, including school staff, will host four regional community meetings for families to come learn more about the new requirements, the new sequence of courses, and options for students. (Me): What would be the better way forward for changes to the science curriculum? Don’t destroy a course content and sequence, morph it. Keep the existing sequence of physical science, biology, chemistry and physics…but add to those existing courses missing key NGSS points. Need some physics concepts loaded into sophomore general chemistry…DONE! Need more advanced physics or earth science loaded into physical science…DONE! Need chemistry concepts loaded into biology…DONE! If this sounds crazy…why is that what the Bellevue district is doing? Why is that what the entire state of California is doing?. If you compare a Bellevue college application (full year of algebra-based chemistry) as a sophomore or junior to one from SPS with 9th grade chemistry…who do you think is going to Dartmouth? UC Davis? One good question that some high school science teachers have: What to tell parents on rapidly upcoming school tours. High School Science Curriculum "Alignment"
Apparently a whole lot of work has been done to completely re-vamp the high school science curriculum. And now that all of the work has been done and all of the decisions have been made, the District is ready to engage the public. Valerie and I were both surprised by the what was considered “infrastructure” by many in the audience and that perceptions of infrastructure were limited to amenities such as markets, shops, etc. but not inclusive or considering schools, adequate access to first responders, or impact on Metro services, etc. It was also unsettling to hear how unaware the audience was as to the capacity issues the district faces and the resources that are critical and should be accessible to families in need at school sites (ie. Counsellors, Social Workers, School Nurses) to best ensure every chance for educational opportunity, student support and success and that these are not fully funded and thereby not readily available. We heard so many in this audience say "it doesn't cost much to build a school" or "it's easy to add buses" or "these neighbours can afford to pay more in taxes to get these things into Magnolia". Once again, there was a marathon Board meeting; I stopped at 6 hours. This really needs to be stopped and there need to be some measures to curtail them. The Board members openly admit to being exhausted (for me, this generally kicks in around hour four and I was watching from home), staff has been at JSCEE for 12+ hours and, of course, most of the public cannot participate that long. When you can be an hour into a meeting and no real work has been done, you are off the rails. All minutes become hours. I forgot to include the Saturday meetings but Director Burke is having a meeting today, Sunday, the 21st, from 2-4 pm at the Fremont Public Library. January 21-27 is School Choice Week, a multi-million dollar campaign funded by right-wing groups like the Koch Brothers, The American Federation for Children, ALEC and the Walton Foundation. The endgame is to replace public education with privatized systems of schooling. Read what the Center for Media and Democracy had to say here about School Choice Week. 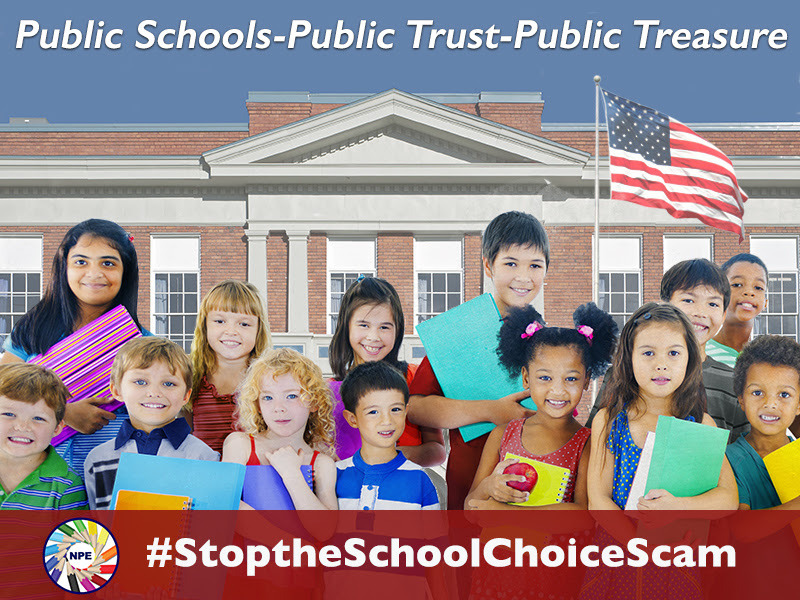 We need YOU to help us tell the public the truth about so-called School Choice. And so we created a powerful campaign for you to use and share here. I also want to call attention to the members of our Seattle School Board as it is Board Member Appreciation month. Thank you to Leslie Harris, Scott Pinkham, Rick Burke, Jill Geary, Betty Patu, Eden Mack and Zachary DeWolf for stepping up to do this hard work. On the heels of the suicide of WSU's quarterback, Tyler Hilinski, comes news of a suicide of a freshman girl in Richland, Washington. Forefront is an organization that works to prevent suicides; their website has a plethora of info. Given some of our discussions here, I'm linking to an event at MOHAI - Segregated Seattle: From Redlining to Gentrification. The panel includes an SPS teacher, Sean Riley, who teaches at West Seattle High School Blaine K-8 and who wrote in The Stranger about his experience when SPS was busing for integration. Admission to all state parks is free in honor of the day. Note: The free days do not apply to Sno-Parks. One director community meeting this weekend, on Sunday, with Director Mack at Magnolia Library from 1-2:30 pm. The Seattle Times has a lengthy article about Seattle Schools' efforts on race and equity and closing the opportunity gap. I'll have a separate thread on that one because there's a lot to unpack. I feel like every single American needs to do this and since I have a public forum, even more so. To anyone from Haiti, El Salvador, any African nation or any nation that is majority non-white, I apologize for the completely out-of-line, undiplomatic, hateful and yes, racist comment by Trump. I heard on KUOW that SPS teachers may take a half-day walkout in support of bus drivers. It was stated that it would likely be on Wednesday when there is a half-day of school so as to not interrupt student learning. Keep this on your radar. Update: when it makes national news, then it matters. The Vermillion Parish School district superintendent cries on-camera. The closest SPS schools are Cooper-Boren K-8 and Genesee Hill and two private schools. Editor's note: got SW in my head and the address is South. That places this school nearer to Hawthorne and Dearborn Park. It is to be called Ashe Prep Academy. It will start with K-2 and 6th. The lead on this effort is Dr. Debra Sullivan who is the President of the Seattle Affiliate of the National Black Child Development Institute (NBCDI). To note, what the Charter Commission received is just a notice of interest (NOI). Notices of Intent (NOI) to Apply were due on December 1, 2017 and the WSCSC received four. - Fursan School, a K-12 that would start with Pre-K, K-2, in "King County" and be a bilingual STEM school. Al Fursan ( in English The Knights) is the aerobatics demonstration team of the United Arab Emirates Air Force. -Intergenerational High School, an arts/STEM school, in Whatcom County. Among what they hope to provide for students is this: Experiential and Phenomenon-based, Intergenerational mentorship. All three hope to open in 2019. Here's the link to both parts of today's Work Sessions; the first on high school boundaries and the second on the budget for 2018-2019. Currently, the high school boundaries discussion is first, starting at 4:30 pm. The Budget portion starts at 6 pm, with an Executive Session (closed to public), starting at 7 pm. You'd have to be very new to this district to not know we have a fairly regular pattern of segregation in this district. I will continue to say that I believe it is mainly the result of redlining for decades in Seattle and yet, was probably helped by the district following along. The district did trying busing in the '70s but my impression is that almost no one was happy. Just as many high school parents are today arguing against long bus rides for their students because of not having friends in the community, after-school activities and family time, many families back then found busing to have that problem. With all the flailing around about where HC high school students will go and drawing high school boundaries, there has not been much talk about segregation. There have been several new articles on this extended topic (bold mine in all cases). Literary Career Day is a free event providing young people ages 16-24 with direct access to industry professionals through networking, experiential learning, engaging conversations, and performances. Participants are exposed to a wide range of career opportunities including writing, editing, publishing, arts administration, retail, library sciences, journalism, teaching, and more. Literary Career Day takes place on Saturday, February 3 at The Seattle Central Library from 11:00am–4:00pm. This event will start with Keynote Speakers, followed by lunch—free for all attendees—and a Table Fair featuring opportunities from local arts organizations. After lunch, attend the Breakout Session that's relevant to your interests. We'll finish off the afternoon with a Networking Party, featuring a live DJ, to help you get the most out of your Career Day! Literary Career Day is produced in partnership with One Reel, Seattle Public Library, Seattle Office of Film and Music, and Seattle Office of Arts and Culture. It doesn't say but I think registration is required. Hope you saw my heads up on a possible bus strike due to drivers rejecting management's offer. BREAKING: The Dow Jones industrial average closed above 25,000 points for the first time. BREAKING: The parents at my kid's Baltimore public school raised their own money to keep the school librarian. It was reported to me that former director Stephan Blanford had spoken at a Race and Equity team event. My source stated that he said that "he took a two-month family trip to Europe to purge his time at the school board." He also said that he was the only director who always pointed out that race had to be considered in all the decisions the Board had to make. Apparently, he's going to just keep doubling down on being disrespectful to his former colleagues. I have to wonder what Directors Patu and Pinkham must think, also being people of color. He did, however, give the keynote on Critical Race Theory at Saturday’s racial equity team training. My understanding is he received honorarium. GIVE KIDS A SMILE - FREE DENTAL SERVICES FOR KIDS! February 20, 2018, 1-5 p.m. Numbers released today by the National Board for Professional Teaching Standards (NBPTS) show that Washington has the most new National Board Certified teachers (NBCTs) of any state (1,434*). The total number of 10,135 NBCTs is third in the country overall. I checked and it looks like SPS has 600 teachers with this certification. We want to share the latest information about labor negotiations between First Student and their employees’ union. First Student presented an offer, and drivers voted it down Saturday, Jan. 6, 2018. This could lead to a second, longer school bus strike by First Student drivers. We will be monitoring the situation closely and sharing news with our school bus families as soon as we know more. Right now, we expect normal bus service on Monday, Jan. 8. If this changes, we will notify bus riding families on school and district websites, on social media, by phone and email and through local news. We advise our families to revisit their backup transportation plans and update as needed. We are concerned that First Student's offer didn't meet drivers' expectations. We hope First Student and the union move quickly to resolve their differences Follow Seattle Public Schools on Twitter @seapubschools and like us on Facebook. Thank you for your continued patience and planning. In a spirited and emotionally charged meeting, First Student drivers voted today by a margin of 85% to reject the most recent offer from their employer. A protracted strike appears imminent at this point. High School Boundaries - What Do You Want to Know? Update: the latest from the district and the High School Boundaries Task Force. The Board is to have a Work Session this week (Wednesday - with two of them - one for high school boundaries and one for Budget; I will let you know when the agenda is available which one appears to be going first). What questions DO you want to see the Board ask/that you want an answer for? The Maple Leaf community is meeting with Director Pinkham on Tuesday, January 9th, 6-7:45 PM, in the cafeteria at Olympic View Elementary School regarding the proposed high school boundaries for our neighborhood. Other Directors have been invited as well. ﻿﻿Adopting Resolution No. 2017/18-10 to establish an equitable vision for advanced coursework by replacing highly capable pathways at the high school level with a localized assignment model by 2021-2022 (Geary, DeWolf). I'm a little puzzled why this needs a resolution but maybe Geary and DeWolf are making a point. Naturally, the district no longer attaches documentation to agendas, I have had to request it in order to read the resolution. This is following by Brent Jones' presentation "Formula for Success" - Superintendent SMART Goal 2, Elminating Opportunity Gaps. Then there is the "Equitable Access Annual Report." Following that is an Advanced Learning Update and Math Adoption Update. Work Sessions: High School Boundaries; Budget, 4:30-7:00 pm. No agenda or materials yet available. Ballard High School, NW211, from 6-7:30 pm. All families are welcome to these workshops! Executive Committee meeting, JSCEE, from 8:30-10:30 am. No agenda yet available. Seattle Public Schools has prepared a Draft SEPA Checklist for the Ingraham High School Classroom Addition Project. A public meeting will be held on Thursday, January 11, 2018 from 6:30 - 8:00 PM at Ingraham High School Library located at 1819 N 135th Street, Seattle, WA to present the project and answer questions. The District seeks written comments on the Draft SEPA Checklist. The Draft SEPA Checklist can be viewed by clicking here. Also of interest, the SEPA page at SPS for capital projects. BEX Oversight Committee Meeting, JSCEE from 8:30-10:30 am, no agenda yet available. Community meeting with Director Mack at Magnolia Library from 1-2:30 pm. Editor's Note: I erred in my description about the timing of Congresswoman Jayapal's involvement. This occurred when she was a state rep, not since she was elected to Congress. The reason the development of the Green Dot high school in the Rainier Valley may have come to a halt is that former Board President Peters became aware of it in November. She let the General Counsel's office know and mentioned the possible ramifications to Rainier Beach High School, Aki Kurose Middle School as well as Franklin HS and Cleveland HS. The district had a land-use attorney look into it and yes, it was discovered that it appeared that departures are only legally allowed for SPS schools. As well, SPS must be represented on the committee that was deciding these matters, and yet had not been included. SPS General Counsel then sent a letter to the City, referencing the laws and codes and voicing SPS opposition. Given that one departure got thru in July, it would seem that those City employees who oversee this work need to have a legal update training because either someone was looking the other way or was trying to decide on their own what the ordinance means. Lawyers hate that. Personally, I think it was not ignorance; I think someone (or someones) was hoping it would go thru unnoticed until maybe AFTER the building was erected. Whoops! So it's not even just the ordinance's reference to a "public school"; it's also that the City ignored who should have been on the committee. I'll just note - again - as I did to the City Council that yes, Green Dot is a public school. But that's not how the Supreme Court ruled on charters, given our state's constitution. They are not what the constitution defines as "common schools" and not funded as common schools. As well, the ordinance says "local governance" for public schools and the City officials generously included the Governor and the Board of Education and the Washington State Charter Commission in that. I'll go out on a limb here - none of those are locally elected offices. Some of them aren't even elected. Also to note, about Green Dot being "a public school" - they don't say how to file a public disclosure request which is something that any citizen should be able to find at any "public school" district's website. On Wednesday, Jan. 3, 2018, the Seattle School Board passed a resolution asking the City of Seattle to not approve changing the ordinance for school zoning departures in order to accommodate Green Dot charter schools. Green Dot hopes to open a charter high school, the Rainier Valley Leadership Academy High School, which would compete with Franklin HS, Cleveland HS and Rainier Beach High School. It would be located nearest to RBHS. Note to self; don't call anyone in any kind of government/school office on a Friday (even before 3 pm), they are all gone. I have a ton of calls into City Hall and SPS and there's nobody around. Thanks to a reader for this heads up from My Ballard/KING 5 about a Magnolia parent has suggested the district is legally wrong about threatening to sue the district over access grandfathering her child at Ballard High School where he is already a student. The article is also notable because someone purporting to be City Attorney Pete Holmes weighed in at the comments. “If we have to go to court, you will stay at Ballard because it’s the legal and right thing for them to do,” she said. No kidding and look where we are now. The Times has a tepid article about the issue with Green Dot charter schools and their need for a departure from zoning laws from the City. My article has a lot more meat and information to it. And then they immediately have another article from the head of the Washington State Charter Schools Association. But the Times likes charters so that's no surprise that they want to shore up what they like and ignore real news in their reporting. Friday, January 26th is Count Us In, King County’s Point-in-Time Count for all populations. Count Us In takes place on Friday, January 26th from 2AM to 6AM. On Friday, January 26th, volunteers will be asked to work in teams of 2-3 to conduct a visual count of individuals experiencing homelessness across King County. Teams are comprised of community volunteers and expert guides (individuals currently/previously experiencing homelessness), who will walk/drive all over their assigned routes beginning in the early morning hours (specific times to be determined). Volunteers are expected to have a cell phone, and and to walk approximately 2-3 miles if necessary. Volunteers with cars will be asked to help transport their team members on the day of the count. Great story from the South Seattle Emerald - How a Mother’s Fierce Love is Transforming Community and Family Engagement Practices for Somali Parents in South King County School Districts. The Baltimore teachers union is calling for all schools to be closed due to lack of heating. Seeing kids zipped up in their coats and huddling around for warmth doesn't seem conducive to learning. I have to say, I tutor in an older building and it is chilly sometimes. Hard to imagine what it could be like with frigid temps. Anyone attend the Friday meeting of the High School Boundaries TaskForce? Let me know and I'll start a separate thread. Ballard's Science Department Uses Logic on the District; Will It Work? 1. Do ALL schools have to do this sequence? Is this “recommended”? As the scope and sequence will create student capacity to take the newly-required 3rd year of science, the sequences are required. All schools are expected to follow the common sequence our High School Alignment Team has outlined. The Alignment Team, represented by all comprehensive Seattle high schools (driven by feedback from individual science departments), was commissioned to create a standards-aligned common scope and sequence that would meet new graduation requirements for current 9th graders and all students that follow. 2. What happens when parents (still) want their students to start Ballard in Biology? It is the obligation of our district to provide all students with standards-aligned courses required for graduation. The first two years provide the core requirements for all students. Selections can be made by students and their parents during the 3rd year with guidance from teachers and counselors. Update from SPS Communications: about the superintendent search, the survey closes Jan. 19th and the Town Hall is January 18th, location still TBA. I only stayed for four hours (but I thought that enough and felt for the Board who had about 16 Intro items - mostly BEX - to slog thru). I am not going to discuss the Green Dot charter school issue - a LOT going on there - and it deserves its own thread. But the Board voted 6-0-1 to pass their resolution against the City okaying zoning departures for Green Dot's new school in the Rainier Valley. There was zero discussion; they just took the vote (although, of course, President Harris asked directors her usual "questions, comments, concerns?). The abstention was Director DeWolf who serves on the board of the Seattle Housing Authority which sold the land for the entire project of which includes Green Dot. He said he was stepping down from that work in March. Naturally the big draw was the discussion on high school boundaries. The speaker list is up for the Board meeting tomorrow; not as packed as I thought with just four people on the waitlist. The majority of the speakers are speaking on high school boundaries (with several wanting to talk about Ballard High).